Children between the ages of four and seven are usually the most challenging group to instruct. They are beginning school with issues such as attention, discipline, effort and attitude to be addressed and improved. Some children in this age group find the structure of school too demanding and are easily distracted. Others lack the confidence to participate freely in a group setting. Most children in this age group need greater confidence and a determined mind to face the work and people they meet outside of their homes. Mr. Hannah and his team of dedicated instructors either have youngsters this age or have already raised a family. Many of them belong to the immediate and surrounding communities. They realize that children in grades Kindergarten through Second or Third Grade have special needs, and the instructors are prepared to help make a difference in how your child performs in school and at home. Hannah's Black Belt Academy begins by building confidence, friendship, teamwork, respect, cooperation and obedience. 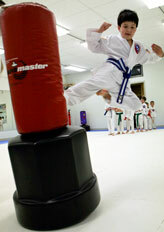 Children learn the basic moves of self-defense and practice the art forms of Tae Kwon Do. These will include all of the basic techniques needed to defend ones self, while still having FUN! If your child loves or needs to move, Hannah's gives them a running start that they'll remember for many years! The eight through fifteen year old age group benefits from the basic moves of self-defense and practices the art forms of Tae Kwon Do. 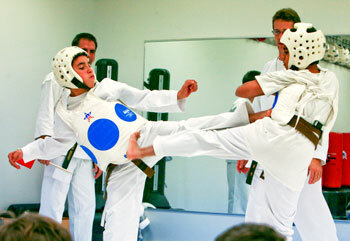 They additionally get more motion and stimulation through practicing other Tae Kwon Do techniques. To keep this group motivated, Mr. Hannah kicks it up a notch (no pun intended) for the children participating in these classes. The "older" children are encouraged to develop higher levels of thinking and self-control, while becoming more physical in the gym. 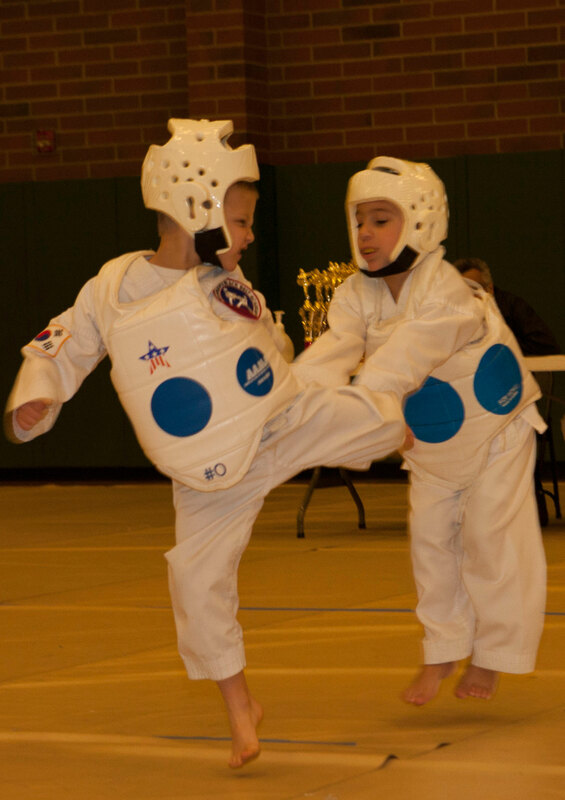 As the formative years come to a close, young people in this age group love to become involved in the competitive side of self-defense, and sparring. Sparing builds endurance, confidence and self esteem. teenagers are "finding" themselves. One of the best places to search is inside Hannah's gym. Young adults from this age group get a rigorous workout and disciplined outlet for excess energy. They learn the self management and restraint necessary to spar with physical and mental control. Teenagers usually find discipline hard to handle. Mr. Hannah and his instructors are authority figures that help teens handle discipline and maturity. Parents also benefit from Mr. Hannah's interaction with the students, because he not only teaches, but also speaks with, listens and familiarizes himself with each student. The teens that actively participate at Hannah's are more likely to practice restraint, self-control, and gain respect for authority. Mr. Hannah develops leaders who become responsible to themselves and the community. Mr. Hannah begins to promote dedicated students from this age group to the higher ranks. Their training prepares them to enter society in their chosen fields of study, aids them in developing strength of body, mind and spirit to survive in our competitive world. It has been said that you cannot tell the 16 to 25 year old group much of anything that they do not already know. 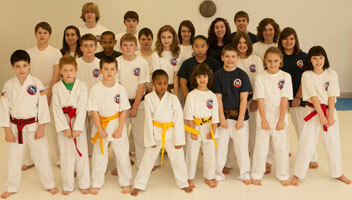 But all joking aside, this group can develop physically and mentally by enrolling in Hannah's Black Belt Academy. Hannah's pushes you to the limit of your endurance, strength, speed and ability. With most people at their physical peak during these years, these advantages enhance the thinking and intelligence that make Tae Kwon Do different from other styles of self-defense. See what rigorous self-defense class can do for you and challenge your manly ego or feminine superiority! You will be pleasantly surprised. Many changes happen to the body between the ages of 25 and 40. Many of these are not invited, welcomed or pleasant. Joining Hannah's is a way to counter these changes by keeping the body fit and the mind sharp. The school has a wide range of class times to accommodate busy schedules. The classes also vary in technique and tempo to keep them fresh and interesting to attend. I hear many folks over 40 say that Karate is something they've always wanted to do, but never had the time or resources when they were younger. It does not matter what walk of life or profession you have chosen, you will always get a great workout! Hannah's never asks you to do something your body is not capable of doing. Senior men and women learn holds and techniques that instill confidence they thought was lost years ago. Mature adults and seniors have everything to gain by staying involved and active. It is never to late to start, and once you do it will be difficult to stay away! Hannah's will teach you the art of protecting yourself without pain or injury, Your heart rate will improve, and your weight will be more easily controlled. Your cardiovascular system will improve and you will generally just feel better.